Seward made it a four game sweep over Hutchinson Sunday with wins of 3-2 and 10-0 in eight innings Sunday on a beautiful day at Brent Gould Field. On a day when the wind wasn’t a factor with 85 degree temperatures, Seward’s number three starter Paul Pulley out dualed Hutch ace Andrew Urban in game one. The Saints handed Urban his second loss in as many games after he came on in relief Saturday. Pulley improved to 5-2 by going the distance and allowing just four hits. Seward tied the game in the third when Tyler Hill drove home two runs. The Saints loaded the bases with no outs in the bottom of the seventh when JT Bean drove home the winning run. 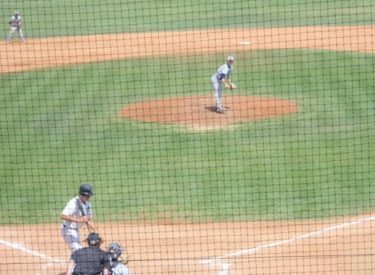 In game two, Seward pitched their first shutout of the season. Keegan Hucul pitched six shutout innings before Jose Gonzalez pitched two hitless innings. Seward scored five in the third, one in the seventh, and four in the eighth. Jordan Dallalio drove home four runs. Jake Barrios had three runs driven home. In sweeping the defending Region 6 champions, the Saints are 33-17 overall and 21-7 in the Jayhawk West while the Dragons limp out of Liberal 25-18 overall and 13-11 in the Jayhawk West.